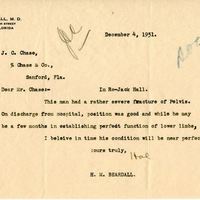 An original letter of correspondence between Joshua Coffin Chase and Dr. Hal M. Beardall, whose office was located at 147 East Church Street in Orlando, Florida. Topics discussed in the letter include the state of health of Jack Hall, who suffered a severe pelvic fracture, most likely at Isleworth Grove. Original letter from Hal M. Beardall to Joshua Coffin Chase, December 4, 1931: box 49, folder 20.84, Chase Collection (MS 14), Special and Area Studies Collections, George A. Smathers Libraries, University of Florida, Gainesville, Florida. 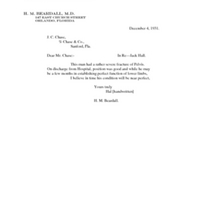 Digital reproduction of original letter from Hal M. Beardall to Joshua Coffin Chase, December 4, 1931. Dear Mr. Chase:-	In Re—Jack Hall. 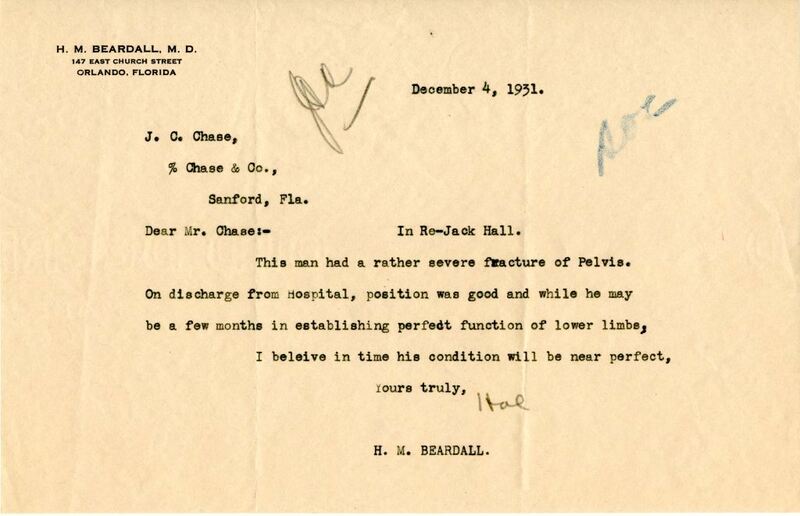 Beardall, Hall M.. “Letter from Hal M. Beardall to Joshua Coffin Chase (December 4, 1931).” RICHES of Central Florida accessed April 25, 2019, https://richesmi.cah.ucf.edu/omeka/items/show/2697.